Series Begins May 1 8. Next month we’re starting our first Acupuncture + treatment series. The first 6-week series will begin May 1 8, and will combine community acupuncture with guided meditation. Each session will last one hour, on Tuesdays from 6-7pm. The 6-session series will cost $100. Q. What will the sessions be like? A. Each session will feature a different guided meditation and a different acupuncture treatment designed to go with the meditation. You’ll arrive a few minutes early to get settled in your recliner. At 6pm, we’ll start playing the pre-recorded guided meditation over the clinic speakers, and will go around the room inserting needles. Everyone will be getting the same acupuncture treatment and there will be no chairside check-ins (like we do during normal clinic hours), so everyone will have their needles inserted within the first 15 minutes or so. Once your needles are in, we’ll cover you with a blanket and you can rest while listening to the guided meditation. After 45 minutes, the needles will be removed, and when the meditation ends, you can head back into the world rested and relaxed. Q. Can I drop in if I don’t want to commit to the whole 6-session series? A. Sorry, nope. If you want to combine guided meditation with your acupuncture treatment on a different schedule, we recommend bringing headphones to the clinic during your regular visits and listening to a guided meditation on your own. Q. I can’t start May 1st, but I’m interested in doing the rest of the series. Can I buy the package and just start late? A. Yes. There’s no refund for missed sessions, but even if you miss a couple, it’s still cheap for acupuncture! Q. My back hurts — can you give me a back pain treatment instead of the same treatment as everyone else? A. Sorry, nope. There are a few reasons for this. One is that the series is specially designed so that each treatment builds on the one that came before it, and to reinforce the meditation in that session. 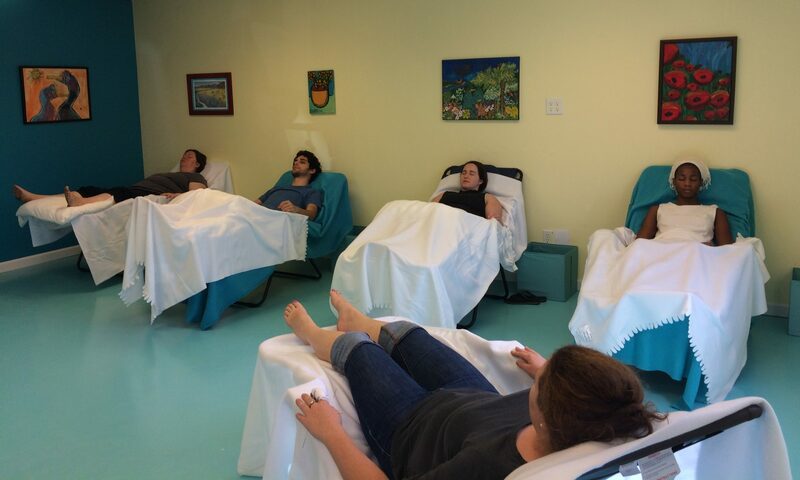 The other reason is logistics — doing the same treatment on everyone makes it possible to get everyone needled quickly enough to get a full acupuncture treatment during the meditation, and avoids disrupting the meditation with chairside chats. You can always come in for regular treatments during normal clinic hours in addition to doing the guided meditation series, though! ** A follow-up: The truth is, any acupuncture will help get things moving, so while it won’t be possible to do individualized treatments for specific aches and pains during this series, these treatments will probably still help with pain, insomnia, etc. Q. What kind of guided meditations? I’ve never done this before! A. We’ll be using meditations from various teachers through Insight Timer. The meditations chosen for this series will be appropriate for beginners, and may include meditations around breathing, body awareness, your emotions, and other topics aimed at lowering stress and anxiety. Q. I’ll do it! How do I sign up? A. You can register for the series here on the website. You can choose to pay online with a credit/debit card, or you can pay in person with cash/check/card at the clinic. Space is limited, so if you are interested, reserve your spot soon! Last appointment begins one hour before close.